I didn’t imagine I’d be live streaming to millions of people around the world on Greenpeace’s social media channels when I first got involved with the Student Strikes for the Climate. 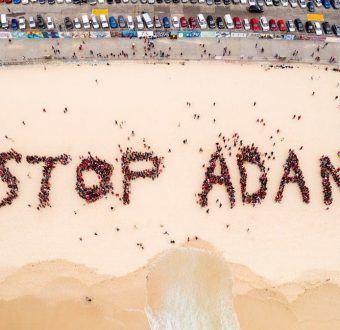 But here I was with thousands of my fellow students from all over Melbourne, brought together by our fear of inaction on climate change and our hope that together we can make a change. 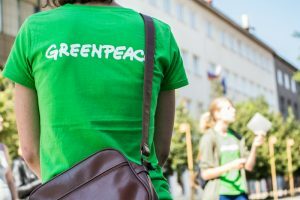 I was one of dozens of students from all over the world who took over Greenpeace’s social media channels to highlight the crisis we are in and the movement for change. My name is Oscar Alateras. I am a 16-year-old high school student currently attending Aquinas College in Melbourne, Victoria, Australia. My dream is to become an environmental engineer where I will not only investigate environmental solutions, but put them into place as well. This is at least 7 or 8 years away, maybe even more, and current circumstances have made it quite obvious to me that I can not afford to wait until then to make a difference in the global battle against climate change. I must start now. This is exactly what I have done. I have been a climate activist for roughly three years now. Many may ask, why climate change? Why is it this particular issue that I have chosen to act against? The answer to this question may vary from person to person, but for me, the answer is simple: passion. Now this passion didn’t just appear out of mid-air. There were specific events that allowed me to discover it. I was in Year 7, and my class was shown the environmental documentary ‘Before The Flood’ by Leonardo Di Caprio. After seeing this, it made me realise that if a man as busy as Di Caprio took the time to film a documentary aimed to raise awareness for climate change, then it must be an important issue. Subsequent to this, I started to spend hours researching about climate change, as prior to the documentary, I had no idea that climate change was even a thing. It didn’t take me long to realise the full picture of what was going on: to realise that were in a global existential crisis. If I am being completely honest, all the alarming statistics and data put fear right into my heart, as I was afraid for the security of my future. I knew it was in danger, and that unfortunately, past generations, the main contributors of climate change, were not willing to make up for their mistakes and save my future. Instead, they were too proud, too selfish to admit they were wrong and chose to ignore the issue even though deep down in their conscience they knew they were putting billions of futures such as mine on the line. This feeling of pure fear coupled with the fact that I didn’t want others to suffer from this crisis motivated me to take action: it motivated me to take my future into my own hands and encourage other young people to do the same. I started with making small sustainable changes to my lifestyle to reduce my carbon footprint; but it didn’t take me long until I realised I needed to do more: the planet needed me to do more. That is when I decided to write a book (The Truth about our world) about climate change to raise awareness, as in order to be in the best position to tackle an issue, we must be educated and have the ability to fully comprehend the ‘entire,’ as this allows us to see the issue from every angle; giving us the best chance of tackling it. Writing has always been a passion for me and I found that it was an effective way to act against climate change, so after publishing the book, I decided to continue on with my passion of writing for climate change and started an active blog full of frequent posts about different aspects of climate change – particularly the hard truths that others were too afraid to talk about. 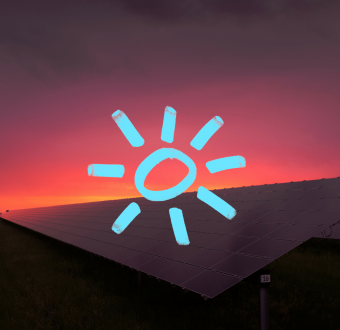 Just like the book, this was an excellent way to raise awareness for climate change and educate others, but once again, I realised it wasn’t enough; so alongside the blog, I decided to do more. This is when I started to volunteer my time to different organisations who shared my passion for climate activism. At first, I got involved with the Greens here in Melbourne – I knew that politics and government was an important space to make the change I want to see. Being involved in The Greens has helped me learn more about Australia’s complex political system and the many barriers to climate change action. 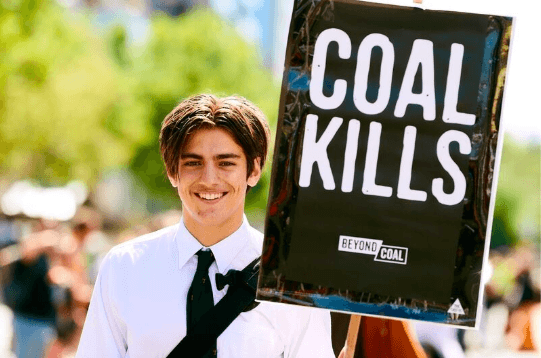 In January of 2019, I attended a two day Summer Training Summit run by the Australian Youth Climate Coalition (AYCC). From this experience, many opportunities opened up. 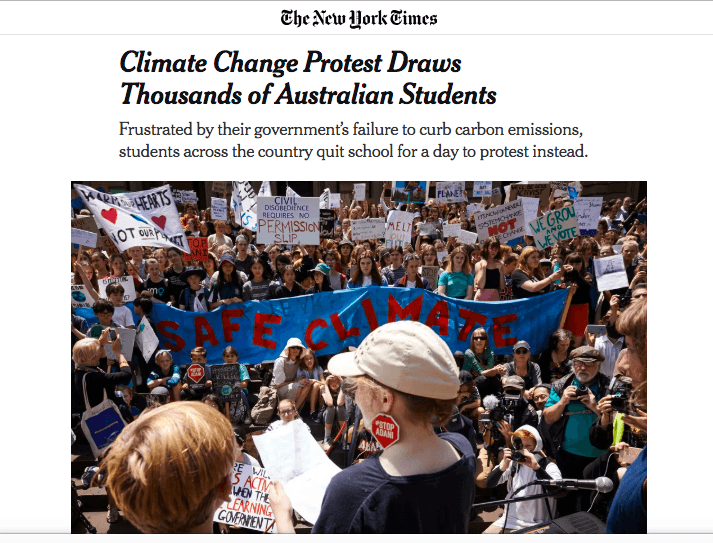 Not only did I learn new things about the vast issue that is climate change, but I was given the change to become more involved in the School Strike 4 Climate movement in Australia. I began taking days off school to strike in front of Parliament steps, demanding action from my political leaders. I didn’t stop there, I wanted to do more and become further involved in the big national March 15 Strike. I believed that building partnership was an important part of growing the movement; which is exactly what I decided to do. I, along with many other wonderful people, worked together to build partnerships between School Strike 4 Climate and unions, MP’s, universities and political parties. This had an amazing effect as it grew more support for the movement, which gave it more power, giving it the ability to influence others for the good of our planet. It was truly inspiring to see our hard work pay off with the 50,000 Melbourne strikers that came out on March 15th. SLP has been such an amazing learning experience. I am halfway through the program and I have already gained so many new skills. The central aim of SLP is to educate members about climate science, politics and the skills needed to create a social movement and influence change. From this, I have learnt the best ways to act against an issue such as climate change and the strategies I can use to make my actions as effective as possible. My story is a simple one. There is nothing complex about it. I am just a young boy who is scared about his future and is choosing not to be trapped in the darkest surrounding climate change, but see the light at the end of the tunnel; working hard each and every day to get there. The only answer, for all of us, is to start. And to start today.